Spirit Sol 569: "Sunset Pan"
Click on image for full resolution Approximate True Color JPG. Click here for TIF version. Click on image for full resolution False Color JPG. Click here for TIF version. This is an image of the Martian sky taken around 6:22 in the evening on Sol 569A (August 9, 2005). The mosaic shows about 40 degrees of the western sky. 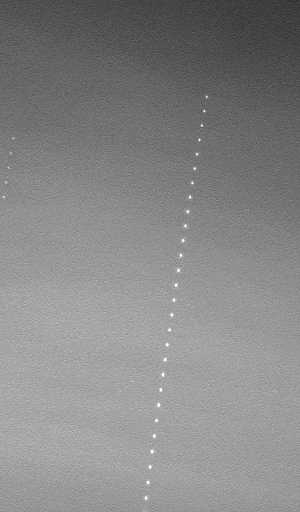 The sun moved slightly between the time each separate filter was acquired, so it appears in more than one place in this image. Pancam's 432nm, 535nm, and 753nm filters were used to generate the mosaic. 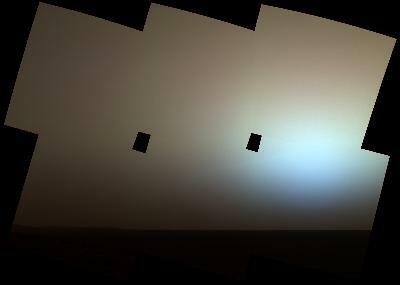 The approximate true color version is close to what you would see if you were standing beside Spirit on Mars. The false color version stretches the colors to highlight variations in the atmosphere. 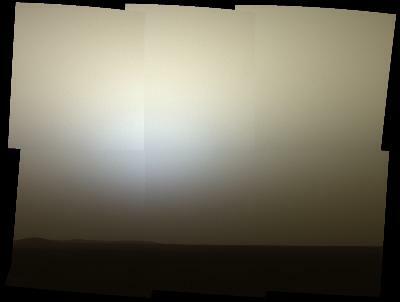 Spirit Sol 526: "Sunset Pan"
This is an image of the Martian sky taken around 5:28 in the evening on Sol 526A (June 26, 2005). The mosaic shows about 40 degrees of the western sky. Pancam's 432nm, 535nm, and 753nm filters were used to generate the mosaic. The approximate true color version is close to what you would see if you were standing beside Spirit on Mars. The false color version stretches the colors to highlight variations in the atmosphere. Spirit Sol 520: "Sunset Pan"
This is an image of the Martian sky taken around 6:08 in the evening on Sol 520A (June 19, 2005). The mosaic shows about 40 degrees of the western sky. The black gaps in the mosaic are due to imaging at a high tilt without adequate overlap between frames. Pancam's 432nm, 535nm, and 753nm filters were used to generate the mosaic. 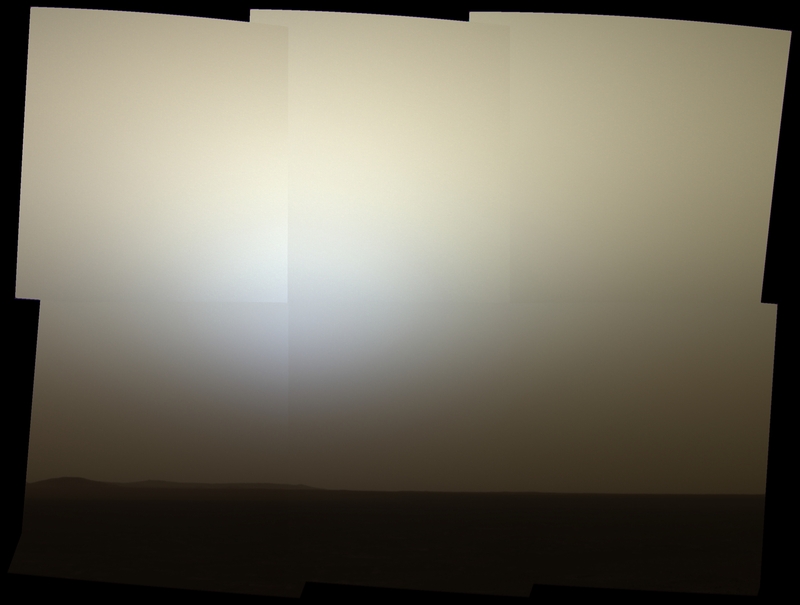 The approximate true color version is close to what you would see if you were standing beside Spirit on Mars. The false color version stretches the colors to highlight variations in the atmosphere. 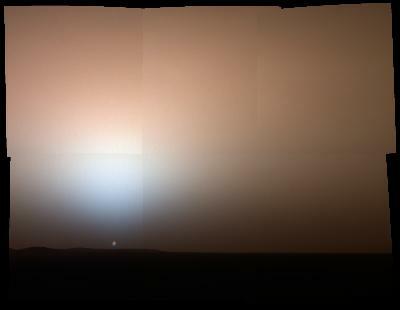 Spirit Sol 518: "Sunset Pan"
This is an image of the Martian sky taken around 6:04 in the evening on Sol 518A (June 17, 2005). The mosaic shows about 40 degrees of the western sky. Pancam's 432nm, 535nm, and 753nm filters were used to generate the mosaic. The approximate true color version is close to what you would see if you were standing beside Spirit on Mars. The false color version stretches the colors to highlight variations in the atmosphere. Spirit Sol 504: "Sunset Pan"
This is an image of the Martian sky around 5:27 in the evening on Sol 504A (June 3, 2005). The mosaic shows about 40 degrees of the western sky. The bright streak in the center is where the sun saturated the frame and caused the image to bloom. Pancam's 432nm, 535nm, and 753nm filters were used to generate the mosaic. The approximate true color version is close to what you would see if you were standing beside Spirit on Mars. The false color version stretches the colors to highlight variations in the atmosphere. These kinds of images are beautiful and evocative, but they also have important scientific purposes. Specifically, sunset and twilight images are occasionally acquired by the science team to determine how high into the atmosphere the martian dust extends, and to look for dust or ice clouds. Other images have shown that the twilight glow remains visible, but increasingly fainter, for up to two hours before sunrise or after sunset. The long martian twilight compared to Earth's is caused by sunlight scattered around to the night side of the planet by abundant high altitude dust. Similar long twilights or extra-colorful sunrises and sunsets sometimes occur on Earth when tiny dust grains that are erupted from powerful volcanoes scatter light high in the atmosphere. 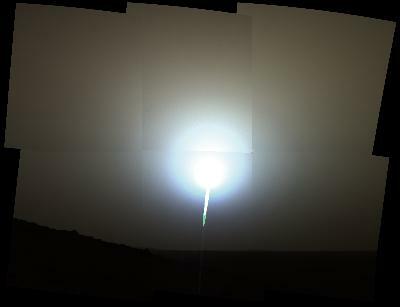 Spirit Sol 480: "Twilight Column"
This is an image of the Martian sky around 6:17 in the evening on Sol 480A (May 9, 2005). It is a single column showing the sky to the West. Pancam's 432nm, 535nm, and 753nm filters were used to generate the mosaic. The approximate true color version is close to what you would see if you were standing beside Spirit on Mars. The false color version stretches the colors to highlight variations in the atmosphere. Spirit Sol 476: "Twilight Column"
This is an image of the Martian sky around 5:51 in the evening on Sol 476A (May 5, 2005). The column was taken directly after a Sol 476A Sunset Pan. The bright streak in the lower frame is where the sun saturated the image and caused blooming. Pancam's 432nm, 535nm, and 753nm filters were used to generate the mosaic. The approximate true color version is close to what you would see if you were standing beside Spirit on Mars. The false color version stretches the colors to highlight variations in the atmosphere. Spirit Sol 464: "Serene Twilight"
This is a false color mosaic of the martian twilight sky at Gusev crater, as imaged by the Spirit rover's Pancam instrument at around 6:20 in the evening of sol 464 (April 23, 2005). Spirit was commanded to stay awake briefly after sending that sol's data to Mars Odyssey right at sunset. During this time, a small panorama of the western sky was obtained using Pancam's 750 nm, 530 nm, and 430 nm color filters. This filter combination allow false color images like this to be generated that are similar to what a human would see, but with the colors exaggerated. 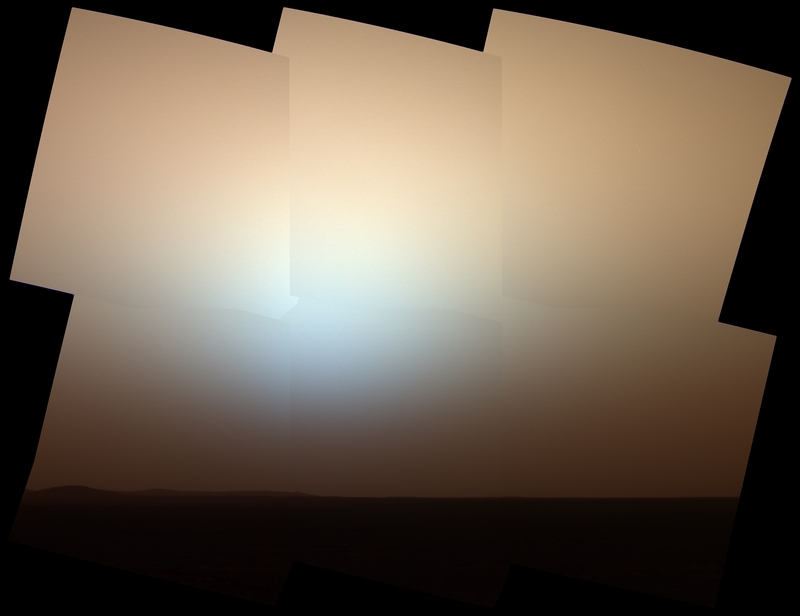 In this image, the blueish glow in the sky above where the sun had just set would be visible to us if we were there, but the redness of the sky farther away from the sunset is exaggerated compared to the daytime colors of the martian sky. These kinds of twilight images are more sensitive to faint cloud structures, though none were detected when this mosaic was acquired. Clouds have been rare at Gusev crater during Spirit's 30 month mission so far, only making occasional appearances. Spirit Sol 464: "Twilight Column"
This column was taken directly after the Sol 464A sunset pan, at about 6:30 in the evening on sol 464A (April 23, 2005). Pancam's 432nm, 535nm, and 753nm filters were used to generate both versions of this mosaic. The approximate true color version is close to what you would see if you were standing beside Spirit on Mars. The false color version stretches the colors to highlight variations in the atmosphere. Spirit Sol 424: "Sunset Pan"
This is an image of the Martian sky around 5:50 in the afternoon on Sol 424A (March 13, 2005). The black gaps in the mosaic are due to imaging at a high tilt without adequate overlap between frames. Pancam's 432nm, 535nm, and 753nm filters were used to generate both versions of the mosaic. The approximate true color version is close to what you would see if you were standing beside Spirit on Mars. The false color version stretches the colors to highlight variations in the atmosphere. This is the first image ever taken of Earth from the surface of a planet beyond the Moon. It was taken by the Mars Exploration Rover Spirit one hour before sunrise on the 63rd martian day, or sol, of its mission. Earth is the tiny white dot in the center. The image is a mosaic of images taken by the rover's navigation camera showing a broad view of the sky, and an image taken by the rover's panoramic camera of Earth. The contrast in the panoramic camera image was increased two times to make Earth easier to see. Opportunity Sol 718 "Earth and Jupiter Rising"
Earth and Jupiter rising in the eastern skies above Meridiani Planum were photographed by the Mars Exploration Rover Opportunity, in the morning of sol 718 (Jan. 29, 2006). The images in this time-lapse composite were acquired at 04:48, and span a time period of approximately 20 minutes. Wispy high-altitude morning clouds can be seen in the pre-dawn skies. Earth is the dot moving up the center of the field; Jupiter is the dot in the upper left that appears near the end of the animation. Opportunity Sol 687 "Earth Rise"
Time-lapse composite (.jpg) (.tif): Earth and Jupiter rising in the eastern skies above Meridiani Planum were photographed by the Mars Exploration Rover Opportunity on the morning of Opportunity sol 687 (Dec. 29, 2005). The images in this time-lapse composite were acquired approximately every 60 seconds using the Pancam's broadband 739 nm filter and lossless image compression. Wispy high-altitude morning clouds can be seen in the pre-dawn skies. Earth is the brighter dot moving up the center of the field; Jupiter is the slightly dimmer dot coming in to the field in the upper left, later. Animation (.gif): This animated GIF image shows the motions of Earth, Jupiter, and high altitude clouds in the pre-dawn eastern skies at Meridiani Planum. The short animation represents about 30 minutes' time on Mars starting at 04:25 local solar time on Opportunity sol 687 (Dec. 29, 2005). Each of the images that went into this animation were acquired using the Pancam's broadband 739 nm filter and lossless image compression. Detailed examination of the brightness of the Earth shows it to brighten and dim as it passes behind the easterly-moving thin morning clouds. Animation (.mov): This animated Quicktime movie shows the motions of Earth, Jupiter, and thin high altitude clouds in the pre-dawn eastern skies at Meridiani Planum. The animation spans about 30 minutes starting at 04:25 local solar time on Opportunity sol 687 (Dec. 29, 2005). The animation begins with a Navcam wide-angle image showing the horizon and sky to the east. An inset is then shown, indicating the position of the subsquent Pancam imaging. The movie then zooms in to display the sequence of images at that location acquired using the Pancam's broadband 739 nm filter and lossless image compression. The Pancam animation sequence repeats three times. This sequence of images was taken by the Opportunity rover on sol 653. Pancam's left camera started imaging the horizon 5 minutes before sunset, and continued imaging until 5 minutes after the sun had set. Filters L2 and L7 (753nm and 432nm) were used in this observation. Opportunity Sol 653 "Twilight Column"
This mosaic of the horizon just after sunset was taken on Sol 653B (November 24, 2005) at 18:03:06 LTST. Pancam's 753 nanometer, 535 nanometer, and 432 nanometer color filters were used to make the images. Opportunity Sol 460 "Twilight Column"
This mosaic of the horizon just after sunset was taken on Sol 460B (May 10, 2005) at 18:08:21 LTST. Pancam's 753 nanometer, 535 nanometer, and 432 nanometer color filters were used to make the images. Opportunity Sol 458 "Twilight Column"
This mosaic of the horizon just after sunset was taken on Sol 458B (May 8, 2005) at 18:03:26 LTST. Pancam's 753 nanometer, 535 nanometer, and 432 nanometer color filters were used to make the images. 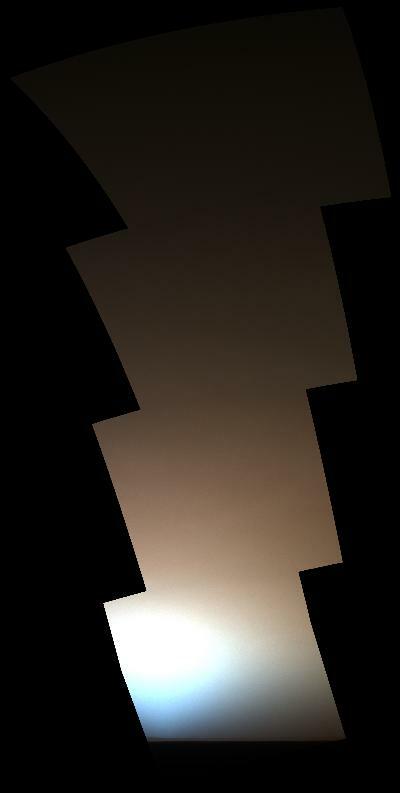 Opportunity Sol 456 "Twilight Column"
This mosaic of the horizon at sunset was taken on Sol 456B (May 6, 2005) at 17:59:32 LTST. Pancam's 753 nanometer, 535 nanometer, and 432 nanometer color filters were used to make the images. Opportunity Sol 449 "Earth in Color"
On sol 449, Opportunity woke up approximately 1 hour after sunset and imaged the fading twilight as the stars began to come out. Set against the fading red glow of the sky, the pale dot near the center of the picture is not a star, but a planet - Earth. Earth appears elongated because it moved slightly during the 15-second exposures. The faintly blue light from the Earth combines with the reddish sky glow to give the pale white appearance. The images were taken with Pancam's 440-nanometer, 530-nanometer, and 750-nanometer color filters. In processing on the ground, the images were shifted slightly to compensate for Earth's motion between one image and the next. On Sol 20, Opportunity woke up around 5:30 in the afternoon to watch the sun set. A series of 5 sets of 3-color Pancam images was acquired looking towards the southwest. Each set used an infrared (750 nm), green (530 nm), and violet (430 nm) filter, rather than the human red-green-blue, so that the maximum Pancam wavelength range could be covered by the observations, enhancing the scientific value of the measurements. A color image was made from the first post-sunset sequence of calibrated color images, with the color balance set to approximate what the sunset color would have looked like to the human eye. The color seen in this first post-sunset image was then used to colorize each image in the sequence. Approximately 1 minute gaps between consecutive color images meant that the Sun's position changed within each color set, so the images had to be manually "co-registered" to compensate for this motion. In this fashion, the position and brightness of the Sun is taken from each individual image, but the color is taken from a single set of images. The images were then combined into a movie where one color set fades gracefully into the next. Analysis of the 5 color sets shows that there were only small color variations during the sunset, so most of the real variations are captured in the movie. The rapid dimming of the Sun near the horizon is due to the dust in the sky. There is nearly twice as much dust as there was when Pathfinder imaged the sunset and this causes the Sun to be many times fainter. The sky above the Sun has the same blue tint observed by Pathfinder and Viking. This is because dust in the Martian atmosphere scatters blue light forward towards the observer much more efficiently than it scatters red light forward, and so a "halo" of blueish sky color is always observed close to the Sun. We're only seeing half of this halo in the movie, because the other half is below the horizon.